The Japan International Cooperation Agency (Jica) has proposed Thailand invest in the construction of three mass transit routes worth 100 billion baht to ease congestion and accommodate growth in and around Bangkok. 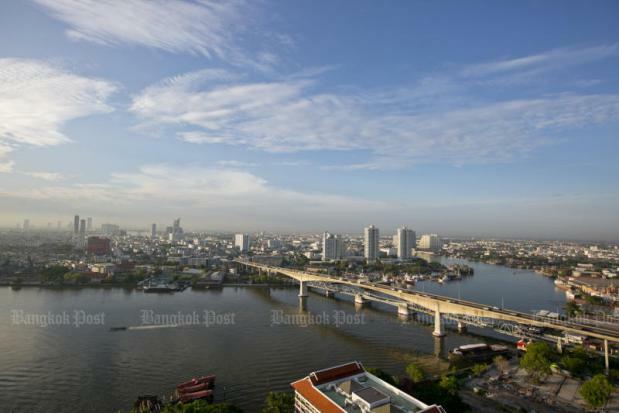 One of the routes is an electric train system valued at about 20 billion baht linking the capital with Suvarnabhumi airport in Samut Prakan, said Sarawut Songsiwilai, director of the Office of Transport and Traffic Policy and Planning. He said the proposed rail project, about 25km in length, is initially designed to run from Bang Na area to the airport. Connecting with the existing Green Line mass-transit system which now extends all the way to Samut Prakan, the proposed electric train route will also accommodate growth on the eastern side of Bangkok, he said. However, Mr Sarawut said transport authorities have yet to settle on a route as there are multiple possible routes to study. The project is likely to be included in a report to an upcoming meeting of the Land Traffic Management Commission chaired by Deputy Prime Minister Somkid Jatusripitak. The report focuses on the principles involved. Currently, the Airport Rail Link (ARL) shuttles around 72,000 passengers per day along a 28km route from Phaya Thai in the inner city to Suvarnabhumi Airport. Mr Sarawut expressed confidence that the next government will drive forward a policy on developing the mass transit system now that various infrastructure projects and the first master plan for mass transit are underway. The first blueprint covers the construction of 10 electric train lines and extensions for existing lines by 2029. Jica, which operates under the Japanese government, has been compiling studies for the second blueprint, known by authorities as “M-MAP2”. It is reported that 10 new mass transit lines for Greater Bangkok are in the pipeline and several will be located in the second ring with a radius of 40 kilometres around Bangkok, linking to Chachoengsao, Nakhon Pathom and Samut Sakhon. Mr Sarawut said “M-MAP2” will cover not only the construction of new rail routes and feeder systems but also the implementation of measures to encourage motorists to switch to public transport. A source at the Transport Ministry said Jica has also proposed the development of a 40km electric train system around the outer ring through Bang Wa, Taling Chan, Nonthaburi and Bang Kapi. Project costs are estimated at 50 billion baht. A source said the project is designed as a feeder system for the main routes and will support growth and expansion of provinces surrounding Bangkok and reduce the number of vehicles entering the capital. According to the source, the proposed Grey Line monorail worth 30 billion baht from Ram Intra Road to Rama IX Bridge and its extension routes from Ram Intra to Lam Lukka and from Rama IX Bridge to Ekkamai is also on the cards. The ministry will study the details of the route and conduct an environmental impact assessment report before seeking project approval, said the source. Meanwhile, the Department of Airports has agreed to hire a consultant to conduct a feasibility study into developing a new airport in Nakhon Pathom to ease overcrowding at Suvarnabhumi Airport and Don Mueang Airport. Amphawan Wannako, director-general of the department, said Nakhon Pathom, west of Bangkok, is a potential candidate due to its proximity to Bangkok and it has a comprehensive road network including Bang Yai-Kanchanaburi motorway, the outer ring road, the Chon Buri-Saraburi-Nakhon Pathom motorway. She said the feasibility study will cover geological factors, engineering aspects, air space use, and environment concerns. Public hearings are being held to gather opinions about the project.